A blog recording memories of the Mount St Helens 1980 volcanic eruptions. One day when I was teaching some students, it occurred to me, abruptly, that none of them was alive when Mount Saint Helens blew her top on May 18, 1980. After asking several questions to determine what students knew about the Mount Saint Helens eruption, I realized that personal accounts from eyewitnesses of the eruption weren't being passed down. In only a few generations, the oral histories of the events that took place in 1980 were disappearing. In no time at all, people will be doubting that Mount Saint Helens will ever erupt again. This blog is dedicated to collecting memories of the 1980 eruptions of Mount Saint Helens. It's an attempt to preserve personal accounts of those eruptions for future generations. I encourage anyone who observed the eruptions or was affected in some way by the eruptions, to tell their story. YOUR story is important! I encourage you to use this blog in class projects, not only to read posted eyewitness accounts, but to have students interview eyewitnesses and post those accounts on the blog. Together, we can produce a robust database that will make history come alive and encourage new generations to learn lessons from the past. Hopefully, this blog will enhance public awareness of how a volcanic eruption can affect communities both near and far. 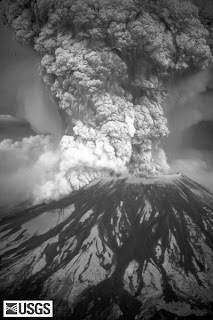 The eruption of Mount St. Helens had a tremendous impact on my life. The events of 1980 led to me studying volcanoes and eventually getting a Ph.D. in volcanology. I was only 7 years old when Mount St Helens started to rumble. I remember hearing a big boom in March when I was vacationing with my family at Long Beach, WA. We all wondered what it was--perhaps a sonic boom from a jet? When we got the newspaper, we learned that the boom we heard was the mountain popping its cork. The main eruption occurred at 8:32 am on Sunday, May 18th, 1980. I remember that fateful day clearly. I was living with my parents in Vancouver, WA and my siblings, mom, and I had stayed home from church. A news report about the eruption interrupted the program we were watching. Shortly afterward, my dad came through the front door of the house and rounded us all up to drive to the end of the street and watch this monumental event--"This is going to make history", he kept repeating. We got to the end of the road and there were cars pulled over and lining the street--everyone was eager to view the eruption. I stood in awe as I watched lightening flash in the eruption cloud and as the eruption cloud grew and blew towards the east. There was no sound but the immensity of the cloud frightened me and I worried my family and I would be engulfed (luckily we stood safely to the south). In June, we got our first ash fall. The wind direction allowed ash to blow to the south of Mount St. Helens toward Vancouver, WA. I remember we had lots of warnings on the news. It was the last day of school and the end of school picnic and game day had to be cancelled--the school didn't know what to do with all the left over and melting icecream bars. My family gathered the ducks and penned them into their wooden "house" to keep them safe. Me and my brother, sister, and mom rushed to the store to get bread. The store was cleared out of bread and milk so we didn't get any. We thought about filling our tub with water like our neighbor was doing but decided not to. The ash turned everything a dingy gray. My dad wore a dust mask and tried to hose off the roof and dig ash out of the gutters before they broke, but the ash got incredibly heavy when mixed with water and the buckets we used to remove the ash kept breaking. The ash was also very slick and made it hard for my dad to move around on the roof. What a cool idea for a blog! My family and I were in Venezuela on May 18th, 1980 (and yet, that date is nonetheless burned in my brain!) and when we got back home to Vancouver in August, Clark County was noticeably changed. One of the things I first noticed was lots and lots of gray hills (piles of ash) where there previously hadn't been any. Eventually, they grew into picturesque rolling green hills, but to this day, I still think of them as the original ash piles I first saw in 1980. The most noticeable difference, of course, was the view of Mount St. Helens as seen from all over Clark County...it looked like someone had taken a giant knife and literally lopped off the peak! I used to watch Mount St. Helens puff away while on the playground of my middle school and it wasn't unusual to see a mushroom cloud during a leisurely walk around our neighborhood. Oddly enough, seeing an active volcano, in plain view, became the norm. When I was 17, I went to visit a college in western NY. One professor I met became excited when he learned where I was from and leapt up from his seat to retrieve a tiny vial of Mount St. Helens ash which he had purchased (!) on a trip to the Northwest. I didn't know what to do or say, given that my parents were still (years later) trying to incorporate heaps of the stuff into their landscaping. Heh! I probably managed a shy "wow" or something equally unremarkable. Heh, heh! I hope you get a lot more (and more interesting thn mine!) comments here! Colleen Riley April 2012. Simple theme. Powered by Blogger.